(CNN) – At the start of President Obama's third year in office, a new poll indicates that the president's approval rating is on the rise. A Quinnipiac Poll released Thursday showed Obama's approval rating at 48 percent - nearing the 50 percent approval rating he has not held since October 2009. 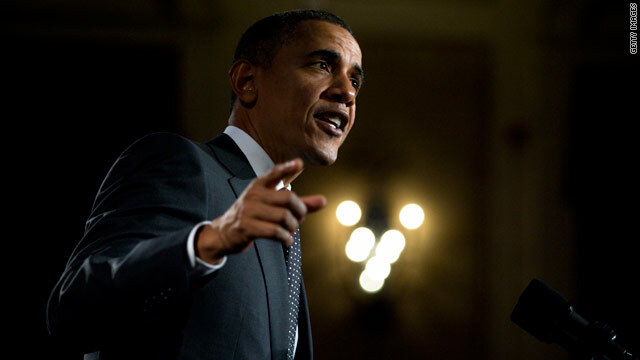 The poll indicates a jump in Obama's approval rating, which was at 44 percent in the last Quinnipiac poll in November. Obama's approval rating is also up in the latest Associated Press poll - six points, from 47 percent in early November to 53 percent in January. The Gallup tracking also shows the same pattern - from a low of 45 percent in late December to the 48-49 percent range in the past few days. The polls support a CNN/Opinion Research Corporation survey released last month which also showed an uptick in the president's approval. Democratic voters continued to give Obama high marks, with an 85 percent approval rating in the Quinnipiac poll. Across the aisle, 84 percent of Republican voters disapprove of the job the president is doing. Independent voters disapproved of the president 46 to 41 percent. Obama also received positive marks when compared to his predecessor: asked whether Obama is a better president than George W. Bush, 43 percent of voters indicated they thought he was, while 37 percent did not. Regarding the president's policies, health care continued to be a contentious issue among voters. In two separate questions, allowing for any answer, voters were asked to name the president's best and worst achievements while in office. Twenty-six percent of voters named health care as the best thing the president has done, while an almost equal amount (27 percent) said health care is the worst thing he has done. The Quinnipiac University poll was conducted from January 4 – 11 and includes interviews with 1,647 registered voters by telephone. The poll has a sampling error of plus or minus 2.4 percentage points. Obama's approval may be on the rise but it won't last for long. He did step up to the "Plate". But now it's time to take care of the problems at home. I just read that "Job Claims" are up 35,000 this is the Xmas part-timers, according to Obama's economice this figure doesn't cout. Let's see where his approval rating is in June. I predict his approval rating will be below 40%. I have all the confidence that Obama and his administration is going to "Screw Up" big time, he's shown in the past and he will show it again. I approve Obama's job performance NOW. I still disagree on issues, but he is doing a good job. I would vote for his second term before I would vote for any member of my (Republican) party who now appears to be a candidate. I just wish President Obama had been in office on 9/11. He would have brought our nation together and utilized all the international support we had. My guess is he would have gone into Afghanistan and worked tirelessly to capture bin Laden (instead of letting him sneak over the border into Pakistan) ... he certainly would not have invaded Iraq ... our nation would be in a much better position today. Why do I say this? Because I believe President Obama cares more about people than oil money, more about what is right than in scoring political points. History Lesson: Back in 1981 & 1982 we lived through the Twin Recessions, then in 1983 our nation's unemployment rate was ....10%! Reagan's approval was 41%, through much of that time. And he was reelected. I believe that America, sees what President Obama is trying to do, how he is working to help the Poor & Middle Class folks. For far too long, the Middle and Working classes have had their incomes stagnant while those of us who make 'bank' are living well! America is no fool, we know that we need a strong Middle Class to succeed or our economy will be hurt. Also, now with the GOP majority in the House, America, will see what a mistake it is to have the "fox in charge of the hen house"! In 2012, Obama will be reelected and the Democrats will regain the House! IT should certainly rise after last night. I have total respect and admiration for this president. He has proven time and time again he is the People's President. If you look at how the economy is coming back (even with the turmoil caused by wall street & hedge fund fat cats) he has worked very hard to help steer this country back on course. There is much that needs to be done and those who oppose this President at the expense of the people of this country should be held accountable. Good to see the independent numbers on the rise. The fact that 84% of republicans disapprove means that he is truly doing what is best for the country, the middle class, our environment and American workers. What upsets republicans most is his reining in the abuses of the republican billionaires in big businesses, big banks,Wall Street, Health Insurance industries, and, of course, big oil. Man, it takes a long time for the kool-aid to wear off, I guess. It doesn't matter, really. If there's 2 more years of unemployment over 8%, Obama is toast. He can brag all he wants about the piddling 100K jobs a month that are being created. Fact is that number doesn't even cover the increase in workforce. It's going to take well over 300K new jobs per month to get us under 8% unemployment bu the '12 elections... that isn't going to happen. Your article starts with how your hero's approval is on the "rise" at 48 percent. Your article ends with how your hero's approval rating was 48 percent last month. Where's the rise? Something smells like fish. Well, at least we know where not to look for truth. So we are a deeply divided country, that's not news. It's pathetic, but not news. If his polls don't rise quite dramatically after last nights uplifting, inspirational speech, then there is definitely something wrong with either the American public's expectations or how these polls are done. Polling around 1,000 people and pretending that accurately represents 300,000,000 people doesn't seem realistic or statistically possible. President Obama is the most caring, intelligent and capable president that America could have right now so I hope people listen again to his speech from last night and learn something from it. He challenged the American people to do better so let's see if they can live up to that challenge. As soon as all the mud, hysteria and outright lies have been hurled, washed off, calmed down, and been disproved, we can sit back and let this man be president, whom the majority of us elected. And, wow, it's not so bad after all. Relax people. You democrats survived Reagan, you republicans survived Clinton, and we ALL survived Bush.........so just relax, relax, relax. As usual this article makes absolutely no sense. The stats you give in your own article would indicate the only rise in obama approval is coming from the die-hard democrats. Among normal people his approval rating is staying the same or dropping. The only accomplishment (if you can call it that) that obama has made is the horrible healthcare bill which is a point of contention and has not helped anyone dem or repub. I am SO proud of our President! He is doing an amazing job. I cant wait to see what he has in store for us over the next 6 years.